The Brighton Marine Palace and Pier is a pleasure pier in Brighton, England. 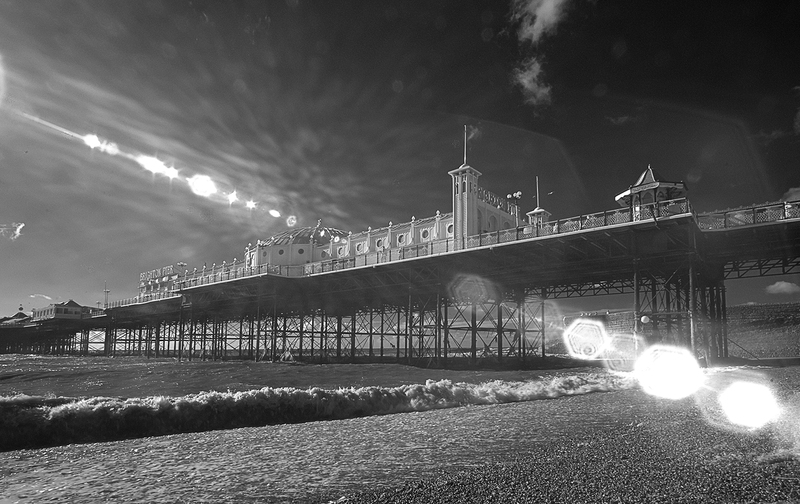 Opened in 1899, it is generally known as the Palace Pier but has been informally renamed Brighton Pier since 2000. This image was shot with a very wide angle lens and demonstrates one of the problems associated with infrared photography, namely ‘flare’. All modern lenses have coatings that prevent flare. Unfortunately these coatings work only at visible wavelengths of light and are transparent to infrared … but sometimes, just sometimes, flare can be quite dramatic. Usually flare is quite distracting but, in this particular case, I felt that it added something to the image. Without these lens coatings all of our photographs could, potentially, look like this.